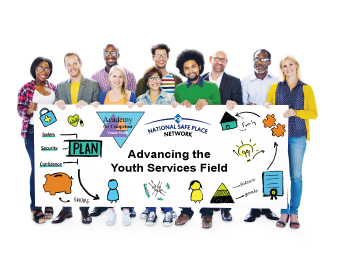 National Safe Place Network is pleased to partner with the Academy for Competent Youth Work to provide Child and Youth Care (CYC) Certification training. The Academy for Competent Youth Work is effectively transforming the practice of child and youth care by focusing on these core goals: 1) Prepare a competent, international youth care workforce; 2) Help youth care organizations develop and implement research-based best practices; 3) Advocate for quality services for children, youth, and families; and 4) Advocate on behalf of Child and Youth Care Practitioners. Through this partnership, NSPN offer the official "Child and Youth Care: Foundations" course and certification exam. Participants may pursue certification at the basic and associate levels (national certification) or the professional level (international certification). Download the Child and Youth Care: Foundations course informational flyer and pricing guide, or contact Kim Frierson and/or April Carthorn at 502.635.3660 or [email protected].